So yesterday I wrote about how we should Inshallah try to really make the most of the upcoming Eid in order to make it fun and memorable for our children, as well as spread the message of love and celebration to the wider community about us! I am going to post some ideas over the next few days but PLEASE feel free to jump in and add your own! Most nurseries (especially Montessori/Steiner and the like) encourage parents to come in and talk about Eid. JUMP at this chance and do it! If you’re stuck for ideas, check out the lesson plan on the link below, which has ideas for objects to take in to show, a rhyme to sing and things to do. Thank you so much for posting this! 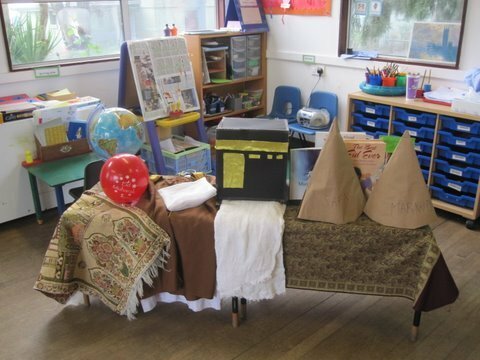 I love the picture and was wondering if you can post another link to the Montessori Eid presentation? I’ll be presenting insh’Allah at my son’s preschool and would love to see your suggestions!